Friends recently had to said goodbye to their 16-year old terrier mix, Sophie. A delightful little sprite, she had a good long life with her owners and the two Apsos in the household. As is so often the case with elderly dogs, quality of life became the deciding factor. Difficult as it is, we owners are called upon to take their pain and make it our own, giving them release from a body and/or mind shuttered with age and disease. In my many decades as pet owner and rescuer, I have been at that crossroads seven times now. While it does not get any easier, each passing has given me a deeper experience base from which to call upon when the next time comes around. And there is always a “next time” for those of us who choose to share our lives with four-legged companions. Over the years, I have learned to set aside my grief and look objectively at what is best for the animal, whether treatment should or should not continue, and how any of it will change the outcome and to what degree. Are they here because they find enough interest in each day to carry on … or is it because I, in my gathering grief, can not let go? Sometimes, the hardest part of letting go is seeing beyond what the heart feels. During email conversations with Sophie’s mom, the subject came up of what to do with the remains of our companions. A profoundly personal choice with no “right” or “wrong” answers, there are a myriad of choices available now. Options that were not available in the late ’80s when faced with my first euthanasia! My beloved cat — Bear — was brought home, wrapped in a blue towel and buried in a corner of our large yard (a practice not allowed now in many communities). A divorce not too long afterwards precipitated a move back to my home state of Colorado and it has always saddened me that my old Bear was left behind. With that experience imprinted, my first Apso, Brittany, was cremated and returned to me in a little floral box. I’ve toyed with the idea of “planting” her in the yard with a spectacular specimen of some sort — high on the list at this moment is a yellow magnolia tree. Then the nagging questions set in, i.e., what if we move away? (And we will eventually move away, even if it is only on a gurney out the front door.) What if the plant dies and we have to dig it up and send it on? So, there she sits, on my bookcase with her collar and tags laid across the top. After the death of my parents along with a major clean out of their house and 50 years’ worth of accumulated items, hubby and I embarked on a major decluttering of our own home. While dusting the bookcase one day, I began to think about how many boxes of ashes I’d eventually end up collecting … and why leave them for my niece to dispense with when our time has run. With four geriatric animals in the house at that point and certainly more in the future, I made the decision to let go of the ashes to come. When we lost Ali in 2011, she was cremated and then scattered at a pet cemetery in Northern Colorado … a quiet place with a stunning view of the Front Range of Colorado. In all honesty, I did not let her go completely. 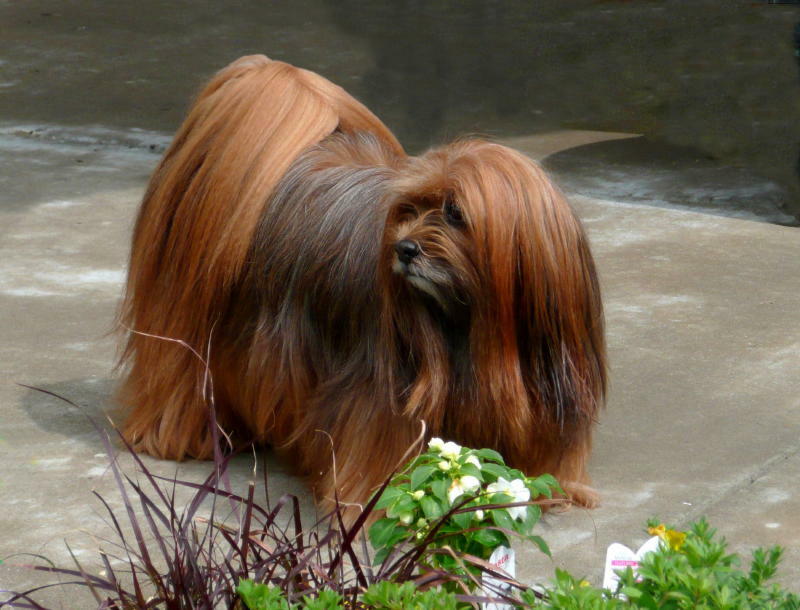 Starting with Ali, all my dogs have been in full coat at some point. Just before being clipped down, I take a lock of the full coat starting at the top of the shoulder … a visual and tangible reminder of the life we shared when they are gone. 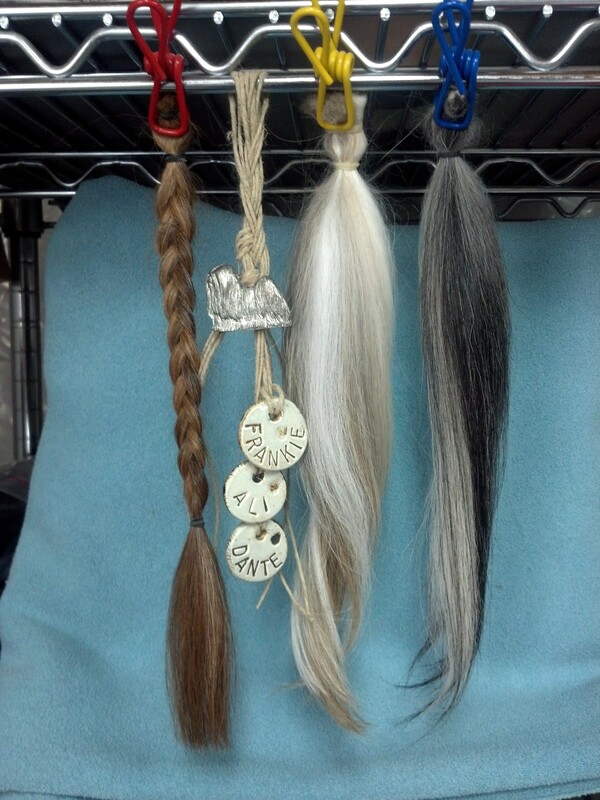 These lockets now hang in the grooming room, a collage of sorts with fired clay name tags from another friend. Hubby has compared them to the shrunken heads one might find in a voodoo shack. But, in the same breath, I’ve also seen him reach up and gently rub the red braid between his fingers. A connection across the years and a whisper from the Bridge … all that remains. So true…we will always have to face the inevitable task of knowing when our family pet has faced all that she can face in this world and as hard as that might be, I will always share my life with a four-legged love. The one thing I’ve learned is that their little lives are short and I should cherish every single day I have with them. Sad days will come, but I want happy memories to follow. 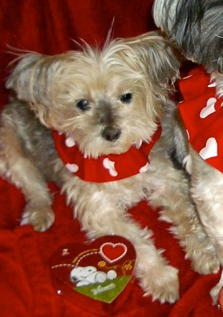 I have known little Sophie vicariously for some six years now, and I shed my own tears at her recent passing. She could not have been more loved and cared for, and when her mom made the difficult decision to let her go, I know that she fully understood the concept of taking Sophie’s “pain and making it her own”. Your explanation is at the heart of what we animal lovers must learn to do, as you said, over and over again. We take comfort in knowing we gave them the best we could, and they, in turn, gave us every bit of love and loyalty they possessed! Farewell, Sweet Sophie! I’ll get to meet you in person someday, somewhere over that Rainbow Bridge! Oh, Vickie, I really like that idea!! Previous PostPrevious SPECIAL ALERT … NEW TOXIN! !